Knickernappies Sighting: Baby-Mel @ The Cloth Diaper Malaysia Blog! Ever wonder about cloth diapering in other parts of the world? Well you may not know it but cloth diapering is gaining popularity in Malaysia. Malaysian moms are getting just addicted to fluff as we are over here in North America. There's even an Indonesian Distrubutor, Metropolis Baby, who caters to retailers in that region. Today's Knickernappies Sighting is the Blog ClothDiaperMalaysia.com. Farhana, a cloth advocate who created this Blog to let other moms know about all the cloth diapering options available to them and to provide information and support. 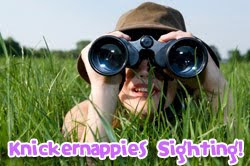 She also features cloth diaper retailers just like we do over here at the Knickernappies Blog! This week Farhana features www.Baby-Mel.com! Baby-Mel is a Knickernappies Retailer and ClothDiaperMalaysia spotlight's Knickernappies diapers in this week's post! So if you're a Malaysian mom, or just curious, head on over to ClothDiaperMalaysia.com and read about Baby-Mel. Scroll down to the bottom of the post and you'll see special offers for customers of Baby-Mel like FREE Shipping and more! Memiliki popok kain sangat senang hari!